Massive beer tanks dominate the room for an unusual and intriguing ambience. 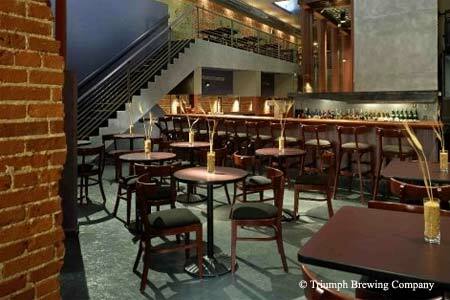 : Just across Nassau Street from the ivy walls of Princeton University, you’ll find this brewpub that attracts a clientele of students and faculty alike. From the upstairs balcony you can overlook the brewery where all the beers on tap are created. The menu is far more ambitious than standard pub fare. For entrées, there’s the Pineland Farms beef tenderloin trio comprising tartare, filet mignon and a steak taco served with baked black beans and quail egg; and the corzetti pasta, a complex mix of lobster, bay scallops, shrimp, English peas, shiitake mushroom and Piave, the intense, full-bodied artisanal cheese, the whole seasoned with earthy truffle salt. For a sweet ending, try the boozy treat, a chocolate stout brownie with vanilla ice cream topped with Jameson chocolate syrup and Baileys whipped cream.